Utilizing the latest in material technlogy,we have re-designed the Bass Gizmotron 2.0 wheels to provide more than TWICE the volume, TWICE the bass, and TWICE the lifespan of the original bass gizmotron wheels. With this advancement, the Bass Gizmotron 2.0 now has the attack power to be used with all types of flat wound and tape wound bass strings. 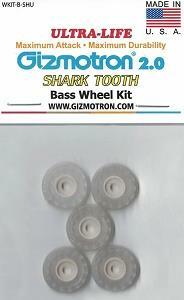 The New ULTRA-LIFE Shark Tooth Bass Gizmotron wheels will be shipping in November 2018 and will be included as the standard wheel on all Bass Gizmotron models.